Because of high deformability even after construction, soil-bentonite (SB) cutoff walls, which are constructed by blending slurry and powder bentonite with in situ soil, are occasionally conjunct with soil-cement (SC) walls or cement stabilized soil having relatively high strength in the case that both strength and barrier performance is partly required. In this study, barrier performance of SBs containing cement at different proportions was experimentally evaluated using a flexible-wall permeameter. Specifically, SCs made with cement proportions of 100, 300, 500 kg/m3 were crushed after certain periods of curing time and used as a parent material of SBs. 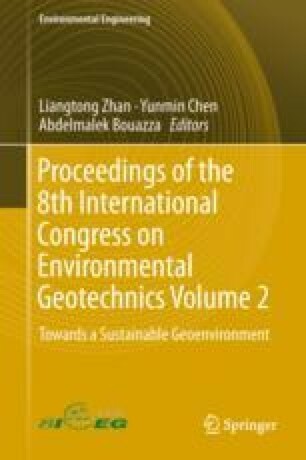 Experimental results demonstrate that hydraulic conductivity of SB containing cement can sufficiently decrease with time when bentonite is blended three hours after cement addition, while barrier performance of SB is insufficiently high when bentonite is added after 7-day and 28-day curing. Thus, a bentonite powder content of 100 kg/m3, which is a conventional proportion for construction of SB walls, is insufficient when cement stabilized soil exists in the ground. The authors acknowledge to Mr. G. Araki, Mr. N. Ukaji and Mr. K. Ikeda (Raito Kogyo Co., Ltd.) for their great support to this research work.